The press release states that these meetups will be interactive and will ‘feature a Co-Creation Ideation – a brainstorming session where attendees suggest innovative ideas and select a project that can be worked on through collaboration on a regional level’. 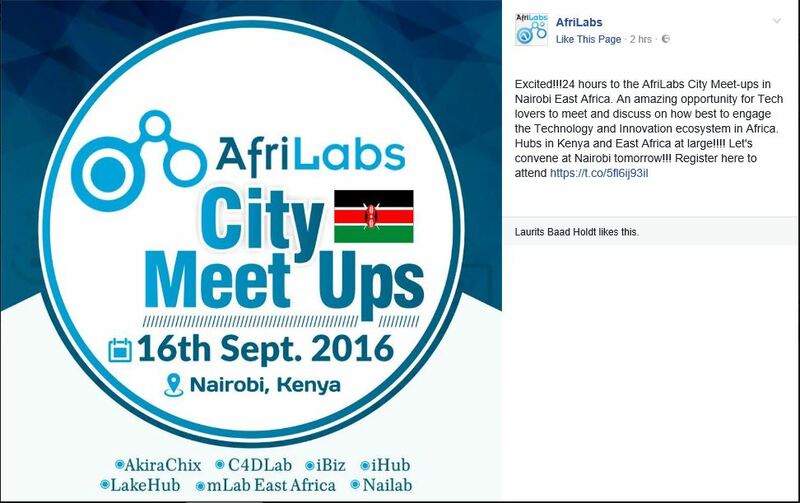 It seems the Nairobi meet-up will focus on how best to engage the Technology and Innovation ecosystem in Africa, according to this Facebook post. Among the other goals of the meet-ups is to raise ideas through brainstorming and select a project that can be done through collaboration in a regional level as well as get partners on board, both new and existing to help in the said projects. The address of the Kenyan meet-up location has not been publicly announced but will be sent to those who will attend via email. Those who would like to attend can fill up the Google Form here and for further enquiries, fire up an email to [email protected] Attendance is open to everyone, including non-members. The culmination of these meet-ups will be followed by an annual Afrilabs meeting on the 26th to 28th of October to be held in Ghana.